Sevilla is one of the most beautiful and culturally rich places in Europe. It is the capital of Andalucia, the most southern region of Spain, and it’s known for its flamenco, bull fights, and siestas. With a history that reaches back 2,000 years, Sevilla has captured the broad influences of all of its past conquerors. The city has maintained the perfect balance between medieval, renaissance, baroque, and reflects its Arabic heritage in its architecture and music. And let’s not forget Sevilla’s culinary expertise: with fresh seafood from the coast and deliciously rich olive oil, it’s one of the gastronomical hubs of Spain. Sevilla wholeheartedly embraces the culture of tapas, small plates of food shared over a glass of red wine. Tapas range from vegetarian dishes like spinach with chickpeas, to fried seafood, gazpacho or cured meats like jamón ibérico (spanish ham). Though they’re not particularly known for their sweets, many convents sell tortas de aceite, thin cookies covered in sugar, or polvorones and mantecados especially during Christmas time. One of the biggest surprises I encountered was the adjustment to Spanish mealtimes. They nibble on toast or just coffee in the morning and eat a humongous meal around 15:00. Then they won’t sit down for dinner until 22:00. Snacks may be needed for American study abroad students who are used to eating every couple of hours. Don’t fret, you’ll get used to eating around Spanish times in a couple of weeks. 100 Montaditos specializes in montaditos, adorable mini sandwiches that cost 2 euro max. They have traditional tortilla de patata (yes they put a potato and egg omelette… in a sandwich), chorizo, and even chocolate for dessert. The Wednesday jug of beer for 1 euro special attracts students and adults alike. Cien Montaditos is reliable fast food for a quick bite to eat. My Islamic art professor, Luis, took our class on excursions each week to explore Sevillan architecture. On one such trip, he treated us to calentitos. In Andalucia, churros are often called calentitos. They use wheat flour instead of potato flour and come long and curly. Luis claims that El Rey, the king of Spain, eats his calentitos at this joint when he visits. This hidden gem is tucked in near the Cathedral and is literally a hole in the wall with a lady standing inside. The traditional way to eat calentitos are to dip them in thick hot chocolate, in cafe con leche, or simply sprinkled with sugar. Enjoy piping hot! 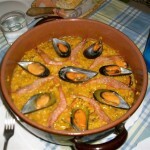 One of the best homemade meals I had was the infamous Spanish paella. Loly, my host mom, was an amazing cook and though Spaniards are often protective of their kitchens, she always invited me to watch. Since lunch is the biggest meal of the day, Loly would prepare all morning, and appear with a beautifully plated skillet of shrimp, clams, squid and mussels, all atop golden yellow saffron rice. It was magnificent. When I loved a dish, boy did I let her know. I wouldn’t stop raving! Most host parents are very accommodating food-wise and want to please you. Don’t be scared to tell them you don’t like something. Remember, they’re not mind readers. Though you may think it impolite to tell them your dislikes, they would rather serve you dishes you enjoy. Just make sure to really praise the dishes you love! One of the most famous Spanish tapas dishes would have to be espinacas con garbanzos, spinach with garbanzo beans. And Rinconcillo is the place to get it. Originally a convent in 1670, it eventually became one of the oldest taverns in Sevilla. You walk in and are first greeted by a beautiful mahogany bar. As you fight your way to the waiter to yell your orders, he will start a tally with chalk right on the bar. Here you’ll be surrounded by elder Spaniards sipping wine- make small talk and get to know the people! Eslava, just a block away from my house, became my favorite tapas place- relaxed but fun. The waiters yell, and may spill a beer or two, but they’re never trashy or too loud. Though we had almost half of what was on the menu, I fell in love with one particular dish: “Huevo Sobre Bizcocho Boletas“, a quail egg on top of mushroom soufflé with caramelized wine sauce. The sweet browned sauce combined with the rich egg running down the sides of the earthy soufflé was absolutely divine. They also had honey ribs, zucchini lasagna, croquettes and more. This avant-garde tapas place was new, refreshing and unique. Eslava was so deliciously wonderful, especially because each dish was 2.30 euro: very reasonable. One tapas specialty is the tabla, or toast. I know—how good could plain white toast be? These are spectacular. Los Coloniales is so popular that even three floors of seating isn’t enough. Though there’s usually a long wait, once you sit, any Tabla will satisfy- you’ll get a thick slab of white fluffy bread topped with various thick sauces. Try the chicken with almond sauce, you won’t be worry. Worth the wait for sure. I’ll let you in on my top secret. Out of the two locations, the one on C/ San Pablo, 45 off of Reyes Catolicos, does not let you try flavors. Therefore, naturally, the other one became “my spot.” Rayas carries a wide variety of flavors including nata con caramelo (cream with caramel), beso de dama (“kiss of a lady” or chocolate swirl), and several fruit flavors. But my go-to combo was always hazelnut and dark chocolate. Even when I sampled the gelato in Rome, nothing beat the avellana at Heladeria Rayas. Though it can feel like a maze getting to La Carbonería, it is definitely worth the show. It has informal flamenco music with intense dancing and guitar playing. Though it’s not the most traditional tablao, the performers are passionate and mesmerizing. Order drinks at the bar, watch, and listen. The room is dark and mysterious, kind of like an underground music festival. Just be careful to not get too rowdy, people will yell at you! 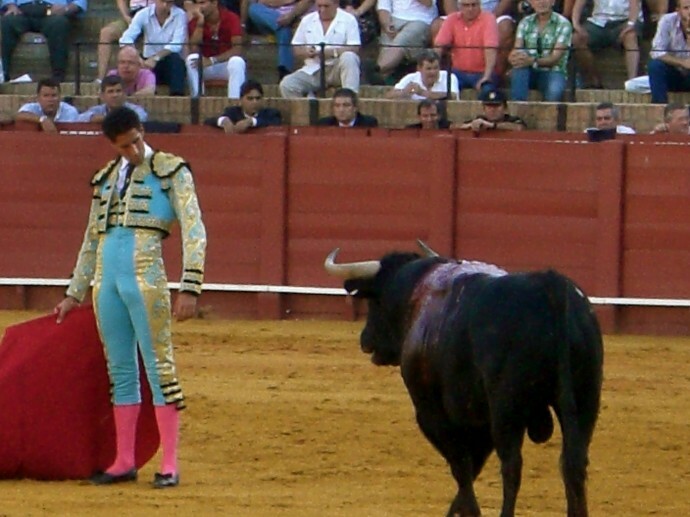 Bull fighting is one of Spain’s most traditional spectacles, and Sevilla’s bull ring, La Maestranza, is the oldest. Though there were times where I covered my eyes, I was glad I went. Though it is brutal at times, the elderly consider bull fighting an important part of their culture, and I didn’t want to miss it. La Macarena is a neighborhood in Sevilla. But more importantly, (and, as you might expect), the famous and beautiful statue of the Macarena resides there. Popular with the elderly, people cry, weep, and kiss the Macarena whenever they visit. A symbol of Sevilla’s powerful dominant Catholicism, it is quite an experience to go to mass there. Of course, the Cathedral is a main religious attraction, but for something more personal, go to the local churches. I still remember the second I walked into the Real Alcázar de Sevilla, it’s truly a magical place. I had never seen Islamic architecture before, but I was instantly was drawn to it. The Alcázar was a Moorish palace built in the 1100′s and displays beautiful Mudéjar style art, created by Muslims during the Christian reign. The flowing fountains and colorful tiles are stunning and picturesque. From any southern city in Spain, Morocco is just a short ferry ride away. I went on a group trip to Fez, Rabat, and the Sahara desert and it was absolutely unforgettable. I can’t even start to describe the excitement and exhilaration throughout the entire trip. Riding camels, eating tagine cooked stews, wandering through the ancient walls of the medina, and hearing the 5 prayers were just some of the magical adventures in my 5 days there. Don’t forget to try all of the sweets like baklava and the moroccan b’astilla- a phyllo dough shell filled with chicken, eggs, almonds topped with powdered sugar. Cordoba is about a 2 hour drive from Sevilla, and there resides the famous Mezquita. This mosque is a World Heritage Site and is unlike any other mosque I visited. Inside, there are red and white arches that seem almost infinite. The most interesting part of this building is that right in the middle, there’s a Renaissance cathedral nave–yes, IN the mosque. It really shows the distinct and intertwined cultures and artistic styles of the Muslim and Christian people in southern Spain. 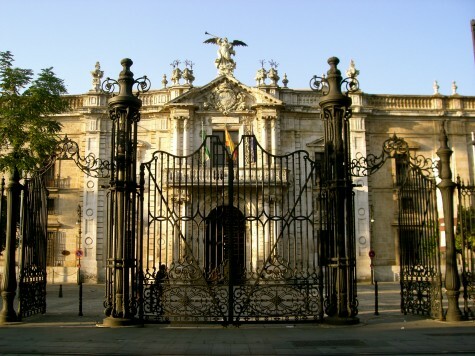 The Museum of Fine Arts in Sevilla has some of the most famous religious paintings by Murillo and the like. If you go on Sundays, you’ll find art vendors selling their own work. I got a beautiful painting of the Real Alcázar there! There’s also a flamenco museum and museums inside historical sites that shouldn’t be missed. Right next to the Plaza de Espana, this beautiful park has flowing water fountains and cool shade to relax and read a book or have a picnic with your bocadillo, or a sandwich. When you need some alone time or a private place to cuddle, this place is perfect. Don’t miss the Glorieta de Bacquer at the entrance near Plaza de Espana, a statue of three ladies. Triana is a neighborhood in Sevilla across the bridge over the Guadalquivir river. It’s the best place to get Sevilla’s famous ceramics. You can find pots, dishes, tiles, clocks—anything. The colors are beautiful, and their authenticity makes for great gifts for friends back home. Be sure to look around the streets for the dozens of vendors with different artistic styles and prices. Though study abroad can be an amazing experience with great opportunities for travel, the most important tip I can give is to get to know your study abroad city. Though exploring other cities is fun and exciting, and of course valuable, understanding the culture, history, language, society, and getting to know your host family and city is vital to any study abroad adventure. Megumi Sasada is the BGSK Ambassador in charge of the Small Kitchen College Facebook Page. She’s a junior at Colby College in Maine and an avid food-blogging (Every Last Morsel), Food Network-watching, nutrition-conscious acapella singer. « prev | Friday Recipe Round-up: Cheating a little!